Sikorsky S-76D VIP Executive Helicopter. Review. A few days ago I wrote a blog article about the impressive executive configuration of the Bell 429 helicopter. Today, readers might be interested in my quick review of the Sikorsky S76D. My thanks go to Steve Ayling and Alex Sharp of Sikorsky who showed me around the aircraft and also shared a link to a PDF brochure of the S-76D. The link is at the end of this article. “The large, comfortable and quiet cabin has been refined to meet the exacting needs of the Fortune 500 business traveler. It can be configured to meet your personal requirements, as an extension of your office to add to your productivity. 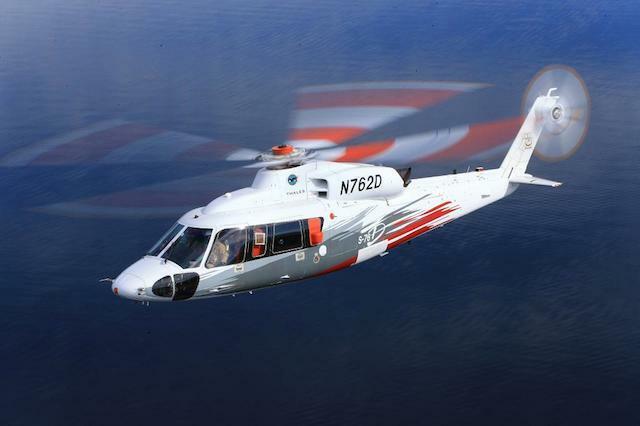 The S-76® helicopter’s strengths include low internal acoustic levels and a smooth ride. Sikorsky’s active vibration control and Quiet Zone™ transmission technology assures that your flight is extraordinarily smooth and pleasantly quiet. The acoustically enhanced environment of the cabin allows you to conduct business conversations or just relax and enjoy the flight. Sikorsky can schedule a demonstration flight at your convenience, allowing you to personally experience the smoothest and quietest executive helicopter for yourself. Below are notes I made during my tour of the aircraft. Please email me (nigel@nigelwatson.im) if you would like further information about acquiring this aircraft for VIP use. The S76C++ is the Queen’s helicopter. The S76-D is where the program has gone. Safest in its class. Millions of flight hours with the S76 airframe. S92 and Commanche material technologies introduced into the S76-D model. Best range cruise speed now increased to 154knots from 137knots. Interior noise levels very good . Sixty S-76D’s sold to date. Approx. $16m depending on configuration. Points to interest the pilot and yacht captain. Blade folding is available for superyacht storage. New power plants introduced the PW210 from Pratt & Whitney. Fuel efficiency has improved. 14-15% increase in power for 8% less fuel. Improved range and one-engine inoperable performance. Exterior noise significantly reduced by redesigning the tail rotor; swept tip wider chord, slower rotation reducing noise and also allowing power to be diverted to the main rotor. Achieves “Grand Canyon” exterior noise acceptance levels. Integrated cockpit environment makes aircrew screen management easier, giving reduced workload reduced and safer flying. Confined area vertical profiles achieved due to power reserves associated with operation. RIPS Rotor Ice protection system allowing flights into known icing conditions possible. First season testing as a kit for S-76D (end 2015 certification: already certified for the S-92). Russia will have the S-92 certified first in Russia and the S-76D thereafter. HUMS Health Usage Monitoring System available on all individual aircraft provide data to Sikorsky Engineering which is then compared against a global fleet of the type looking for discrepancies. Actual happenings and predictive mode looking at possible failures. Field service rep dedicated to a customer. Spare engines located in Europe (Southampton, UK) to be allocated as required to keep a machine flying. EASA validation of FAA certification scheduled for July 2014. First offshore D’s operating for BP and REPSOL in Caribbean. The Sikorsky S-76D is a very impressive aircraft for VIPs who make frequent use of their helicopter and want an aircraft that is made to the highest specification. The quiet operation and executive configuration make this a luxurious and hard working helicopter. From a pilot perspective, the cockpit is very well laid out and there are numerous features which increase safety. From a maintenance perspective, Sikorsky quality and their spares network mean the aircraft will have maximum availability. The aircraft is suitable for heliyacht operations, but I would need to consult with the owner about the suitability of a particular superyacht’s helicopter infrastructure to accommodate this aircraft. I would be happy to share further information about the VIP potential of the Sikorsky S-76D with interested parties. Please email me at nigel@nigelwatson.im.